Because we didn't watch television on Sundays growing up, one of my adult acts of rebellion has been to do the opposite. Mature I know, especially because I'm now wondering if my decision has been ill-taken. It's not just television that I can watch, there are e-mails, text messages, blogs, video games, Facebook, twitter; technology is everpresent. Don't get me wrong, I love technology, but given that I am having trouble hearing myself think (and I think sometimes my kids are too), perhaps I need to love it a little less. In Tiffany Shlain's film Connected she talks about her family unplugging for 24 hours -- she calls it a technology shabbat. Inspired by her film, I proposed to my husband and children we do something similar, that we unplug on Sundays until 2pm. I'm used to Sabbath observance. I've done so my entire life; I even fast 1x/month. But going without checking e-mails or tweets during a substantial portion of my day is harder than anticipated. (#Preciselythepoint). Surprisingly, we've gotten no pushback from our kids; they almost seem relieved. Dinner has been more leisurely because they have all the time in the world. Until 2pm. My 15 yr-old son was willing to take a walk in the neighborhood. My brain has breathing space. William Wordsworth wrote, "The world is too much with us; late and soon; we have given our hearts away, a sordid boon." When I unplug, the world is less with me. I take my heart back. This past week, Jennifer Aaker tweeted the following, referring to an article Technology Will Make You Happier, asking the question -- Why? Technology is enabling the finding of my voice. I wrote in a 2007 blog post titled What If?, "the ease of blogging (have computer, can publish -- no rules to play by or political waters to navigate), many who would never have dreamed of being published in the world of old media, are now pointing, clicking and publishing here in the blogosphere." That technology enables voice-finding has been true not only for me, but countless others. Consider Chrysula Winegar. In 2009, she talked of searching for her voice in the post Oh My Goodness, I Left My Voice on the Bus. Less than a year later, Chrysula hosted a UN Digital Media Panel titled Changing the World, One Mother At a Time. Because she blogs and twitters, Chrysula's voice is no longer languishing on the bus. As is the case with many of you, her voice is beginning to drive the bus. Technology is helping me change my corner of the world. A dear friend of mine recently sent me an e-mail that went something like this: my husband and children are thriving. I, on the other hand, am not; I am a middle-aged, boring woman who doesn't know what she wants to do. My friend really believes what she said, but some of it is patently untrue. It is irrefutable that she is getting older, as are we all; you can read my birthday lament/musings here. But her husband and children are thriving, in part because of the woman she is, and the home she has created. The assertion that she is boring, that there is no future ahead of her, isn't true, no matter how true it may feel. I know her to be smart, dynamic, wise, and beautiful. Similar conversations with other close friends led me to start this blog. If even one woman dares to dream because of what I've written, I will have helped change my corner of the world. Technology is allowing me to connect with and build community. When we feel connected to others, we are happier, thanks to oxytocin. My blog is a virtual water cooler where old and new friends swap stories about daring and dreaming. Twitter is a farmer's market of ideas. As I participate in this idea bazaar, I am creating a community of professional peers. And Facebook -- who hasn't reveled in the outpouring of birthday wishes? My on-line network of professional female peers was particularly important this past week as I prepared to attend an industry conference for hedge fund, private equity and venture capital professionals. Hundreds would be in attendance, but only about ten women, if I'm being generous. This tends to be problematic because transitioning conversations with male conferees from talk of family and friends to shop talk tends to be difficult, dispiriting even, occasionally causing me to feel invisible. Because the value of industry conferences is mostly about the networking, I consequently have to work pretty hard to get a return on my time, money and energy. As I prepped for this year's event, Cali Williams Yost, a woman in my virtual network, encouraged me, rallied me me even, telling me that really showing up was important, not only for me, but also for the women who come after me. That on-line conversation was pivotal. Without technology, I wouldn't know Cali. And I am happy to report that I not only talked to more people than in previous years, and I talked more shop. In other words, I really showed up, and claimed my place. Nearly all of us want to find our voice, to change our corner of the world, and to feel connected. Technology can help us do all three -- and that makes me happy. Some months ago in A Space for Women's Voices I wrote, "I may be only one storyteller, and this blog may not reach many, but for those it does reach, my hope is that Dare to Dream will be a place where women can come to hear empowering stories from and about other women, and are encouraged to start telling stories, our own stories, in which we claim a central place." Lily Liang, my first guest blogger, is one of these storytellers. And, as a woman who majored in Operations Research (read: technology and computers) at Cornell, Lily is uniquely qualified to do the "woman thing" as called for by Tom Peters. When my friend Paulina introduced me to Lily I was so engaged by her story, that I immediately asked if she would guest blog. She has kindly consented; may you enjoy learning from her as much as I have. 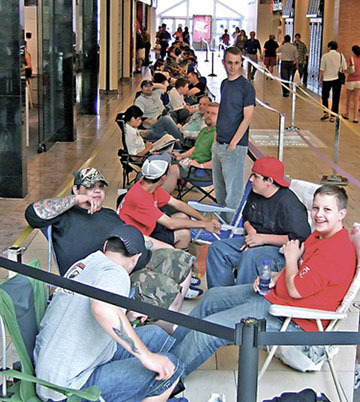 I remember being genuinely surprised when I first read Whitney's iPhone inDifference posting and saw the picture that showed hardly any women waiting in line for the iPhone. At the time, I was living in San Francisco interning with a dot com and spending most of my time outside of work socializing with other MBA interns who worked at start-ups and high tech companies, including Google and Apple. However, I didn’t wait in line to buy an iPhone. Nor have I bought one since. That's not because I don't like technology, I use technology every day. I have a profile on Facebook, Friendster, LinkedIn, and MySpace. I watch videos of missed So You Think You Can Dance episodes on YouTube. I chat with friends and family via AIM, MSN Messenger, Yahoo! Messenger, and Google Talk. I use Skype to speak with my parents who live in China. I have a Blackberry as my phone. And, in my professional life, technology is not only a medium of communication, it is a language in itself. During my career in IT/management consulting, I have had to put my business hat on to ensure a new project is conceptually sound, but it's been my technical background that has allowed me to ensure a project is operationally feasible. And because I help to translate business needs into technical requirements – and vice versa – I'm able to make things happen. I’m not the most well-versed in technology, particularly new ones, but I like to learn about them from those who are more technically-savvy. And I know enough, that I can use it to push a project forward. 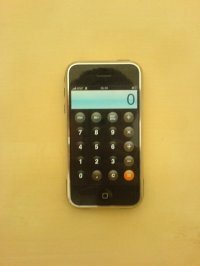 So, why haven’t I purchased an iPhone? Probably the same reason why I haven’t bought a flat panel TV or some fancy video game console like the Nintendo Wii (though, I experienced the Guitar Hero game this summer and it is simply awesome): I haven’t rationalized enough of a need to buy them at their current price points. Trust me – I can convince myself of any new purchase, but being the guinea pig for a fancy gadget before knowing if it works well or how it truly differs than my blackberry has little appeal to me. Women primarily adopt new technologies for function while men often adopt them to satisfy their egos. When I whip my blackberry out, I feel a little silly, but I find it incredibly useful to have email at my fingertips. For a man, the iPhone may offer neat features that help to organize his life better, but it also signifies a particular lifestyle and status that he wants to express to those around him. Do you know any man who keeps his new gadgets a secret? Over the next decade, many technological advances will be introduced that will change the way we live our lives. Some will even assert that their advances will allow us to live better. We’ll be ordering groceries and getting same-day delivery to our homes with a touch of our cell phones. Robotics will become more commonplace in the household, evolving from current robotic technologies such as iRobot’s Roomba. However, technology is most meaningful if it somehow improves our everyday lives. For example, if my mother hadn’t been open to learning email, MSN Messenger and making phone calls over Skype after moving to China with my father (with my sisters and I still living in the states), it would have made it even more difficult having my parents live so far away. 1) Be open to technological advances. 2) Experiment with new technologies that people around you are using - maybe you don't need it now, but you may discover a use for the technology later. Oh, and don’t be fooled by the lack of women waiting in line for the next new gadget, thinking that it means that women are behind the technological curve. It’s all about letting the first movers (primarily men) pay the premium for the new product, discover all of the bugs in the initial release, and then waiting for the next installment of the technology that is not only cheaper, but oftentimes better because the bugs have been fixed (See Week in Review: Apple My Ire). What are your thoughts on Lily's blog? Is there a generational component? Do you agree with my premise that women's innate collaborational expertise needs to be married with technical chops in order for Tome Peters' "woman thing" to happen? What could you make happen if you were to learn more about technology? In your personal or professional life? Did you notice how the myth of Psyche is relevant even with things technical? If you liked what Lily had to say -- and think it's terrific that she took the time to share her voice with us -- do give her an ATTA GIRL in the comments below. And did you see what she does in her leisure time? Now that sounds fun! Finally, if you feel that you have something to say, a story to tell, let me know! Upon receiving a B.S. in Operations Research from Cornell University in 2001, Lily Liang moved to New York City to test out her process skills as a consultant with Accenture. She primarily worked as an interactive voice response (IVR) system functional designer for large telecommunication companies. Realizing that her true interests lie in working with products rather than in the services industry, Lily then took a job with the College Board with their Product Development group. She devoted her three years there with the SAT Program, helping them to introduce the new SAT with Writing as well as other new SAT initiatives. Her career at the College Board not only satisfied her need to work with meaningful products but inspired a new person interest in educational reform. Lily is currently pursuing her MBA at Harvard Business School (HBS). She has enjoyed learning the different functional areas with which general managers interact, and continues to have an interest in working with meaningful products that have an impact on everyday lives. She recently completed a summer internship with Walmart.com where she developed a strategy to support their multi-channel shoppers. Outside of the classroom, Lily is the Co-President of the HBS Dance Club as well as an Afro-Brazilian / Samba teacher and choreographer. Google lost about $13 billion worth of value on Thursday evening. Wasn't its income up 28% over the past year? Isn't that pretty impressive? I mean, I'd like to see my income increase by 28% in twelve months. But....everyone expected income to go up by 29%. What? People dumped GOOG because its income was 1% shy of expectations? A bit extreme isn't it? If we dump a stock because it falls short of our expectations -- even though the actual outcome is impressive -- won't we also dump a dream? Sarah Ban Breathnach writes, "Expectations are the emotional investment that our ego makes in a particular outcome. When we use expectations to measure a dream's success, we tie stones around our soul. Dreams [may] call for a leap of faith, a trusting that [Providence] will be our net, but they set our soal soaring." Two years into pursuing a different dream, I continue to believe what I scribbled in the margin of Breathnach's book Simple Abundance -- [relinquishing expectations] could transform things -- but isn't it difficult not to expect, become attached even, to specific outcomes? Certainly the Google shareholders were. How do we know if "expecting" is eclipsing our "dreaming?" When we spend time with our children, are we disappointed because they didn't want to read books with us? Or are we happy because, in letting them decide what we're going to do, we are 15 minutes closer to our dream of an enduring relationship with our children? Whether our dream is to paint, write a book, produce a film, start a business, have we become attached to a specific outcome, an outcome that we have no control over (e.g. how others receive what we do?) or are we pursuing this dream because it's an imperative for us -- and we're willing to let Providence do the rest? So, so, hard, but we'll get there. And in Breathnach's words, "Dream, do, detach." There's about to be a terrific new space for women's voices. Yes, there are some fabulous women's blogs out there. In fact, more than half of the blogs featured by Typepad during the month of May were blog-hers. However, when it comes to social media platforms (just think "virtual watercoolers"), for those of you that have visited digg, if you're anything like me, you not only didn't dig digg, you ditched it. The categories (Technology, Science, World and Business, Sports, Entertainment, and Gaming) are just not my idea of fun watercooler talk, especially when it's 10pm and the kids have just gone to bed. Now take a look at kirtsy's categories: Around the house: Fashion; Entertainment; Out and About; Mind, Body, Spirit; World Wise: Parenting; Food; Arts, Crafts, Design. I don't typically like to kirtsy to the issues, but with this site I'll make an exception. As the founders (all women -- even better from the standpoint of finding our voices) describe it, "sk*rt is the place to find and/or link to anything and everything on the Web that you'd like to share with other women." That's my kind of watercooler talk! I agree with Tom Peters, but there is a rub. During the play that our family was in, when there was downtime, I found myself observing how the children entertained themselves. One of my 6-year old daughter Miranda playing with her Gameboy (remember she has a 10-year old brother whom she adores and emulates), surrounded by several boys, either playing with, or tutoring her. The other vignette is a group of girls aged 6-10 who, having no interest in playing Gameboy, had invited Miranda to set up a make-believe home/beauty salon. Which is why there's a rub to Peters' argument. While it is true that businesses, and even the world, need women's collaborative expertise, Tom Peters seems to be making an a priori assumption -- that girls and women are technologically savvy. Based on the recent NY Times article, Computer Science Takes Steps to Bring Women to the Fold, and my own personal experience, we aren't, nor do we necessarily want to be. Technology, in the broadest, most generic sense, is often about gadgetry, the gee-whiz factor, an end, in itself, rather than a means to an end: how can I harness this technology to get done what is important to me, which is connect with others. Remember Psyche's journey: she went on her hero's journey -- of figuring out the world -- because of her relationships. But when technology works on behalf of relationships, we become fascinated, even enamored. And Mac stores. These are not stores just about gadgetry, they are about getting jobs done that are important to us. And Webkinz -- those unremarkable stuffed animals that our daughters can love and cuddle with in the real world. AND for whom they must also care for in the virtual world. But if it it gives our daughters the tools they need to dare - and do - their dreams, I'm just a bit crazy about Webkinz myself. Have you found yourself wanting to make something happen, whether for scrapbooking, a community project, or starting a small business, but you just didn't have the technological expertise? And so you had to oursource, or worse yet, you just didn't do it? What if you did have the expertise? How much better would you troubleshoot? Any other ideas about jobs our daughters can do, and will want to do, using technology? Every once in awhile I come home from an event, so thrilled by my discoveries of new people and ideas that I ask myself -- what if I hadn't gone? What IF I had only imagined and never explored? As I was driving home from New York, I kept thinking -- what if I hadn't gone to the BlogHer Business 07 conference? It was there that I discovered Nelly Yusupova who can build a website that I need built, and teach how technology can be harnessed to help me, and in turn you, dare to dream. I also discovered Carmen Van Kerckhove, a 30 year-old Belgian-Chinese woman, whose blog has been a vehicle for finding her voice. Then there was Elise Bauer, one of the WSJ's twenty hidden influencers of the web. Elise is doing precisely what Psyche's journey encourages us to do: embarking on a hero's journey because of and for relationships. Elise's technological expertise has allowed her to share recipes with millions of readers each month, which recipes can bring people together, whether families or communities, through the sharing of a meal. And finally, had I not gone to New York, Elisa Camahort, one of BlogHer's co-founders, couldn't have shared with me the Pew Internet & American Life Project's finding that roughly 50% of all bloggers are blog-hers. Women may be under-represented in the press, film, and television, but we are not under-represented in the wide, wide world of blogs. Which of course makes sense. Because of the ease of blogging (have computer, can publish -- no rules to play by or political waters to navigate), many who would never have dreamed of being published in the world of old media, are now pointing, clicking and publishing here in the blogosphere. As we blog, we are writing about who we are, what we care about, and we are finding our voices. Have you had an experience recently during which the discovery of new people or ideas was so thrilling that you found yourself wondering, what if I hadn't shown up? If you know that you want to write, but writing and publishing a book is too daunting for the moment, why not write-by-installment via a blog? In making a comment on "Celebrating Systergy", Katrina Petersen highlighted for us Mother Venture, a business networking group for work/stay-at-home moms; this is a business idea I know some of you will find intriguing. As I checked in on Katrina's website to say thank-you, I noticed that she just started a 10-part tutorial via her blog on how to start a blog. For those of you that are noodling with the idea of starting your own blog either because there is some topic that you feel passionate about or simply because you want to use your blog as a means of chronicling the pursuit of your dream -- why don't you drop in on Katrina? In the past day or so, did you visit a website, blog, or read an article that you thought one of your friends or colleagues would enjoy? If you haven't sent it -- why not do so right now? Just as Katrina can mentor you on how to blog (e.g. she makes deposits into the Intellectual Immigration fund; you and I withdraw), what do you love to do that absolutely must be shared? Is it something you'd like to blog about? If you have heard the call to adventure, and are daring to dream, why not blog about it? As you write, your dream will become real -- and what a fabulous Christmas present your "dare to dream" story could make, as you bound your blog entries into a book!